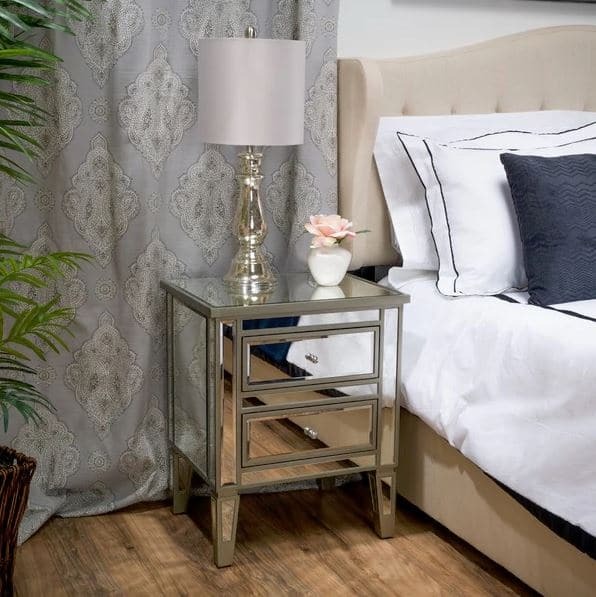 Mirrored nightstands can be pricey, but they don’t have to be! I scoured my favorite stores to find 10 cheap nightstand options for you. We’ve got a bedroom makeover on the horizon, and I’m in that horrible phase of budgeting. It’s the real-life dirty work between coming up with all kinds of pretty plans, the reality of what we can afford, and what makes sense in our house. 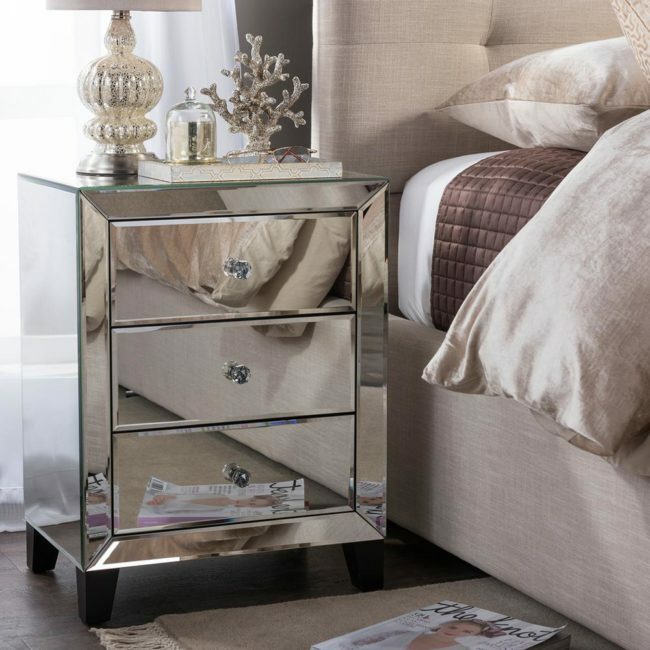 Back in the dreaming-pretty phase, I started a minor obsession with the idea of doing a mirrored bedside tables. They add such a nice touch of the glam I love, but can be combined with a surprising array of styles. I even have a whole board of mirrored stuff on Pinterest! When I started the search, I found a bunch of options in the $600-$2000 range. EACH. Yowsa. I almost typed that I WISH that was my budget, but I have a hard time imagining spending $4,000 on two mirrored bedside tables in any scenario. Maybe if they also cleaned the house? I’m always optimistic that with enough digging, I can get the look I want at a price that doesn’t give me heart palpitations. With some research, I actually found not just one or two, but TEN cheap options in a variety of shapes and sizes. And to define “cheap” for this project, almost all the pieces are in the $100-$300 range. Most even have free shipping! Update: Since a couple from the original image are now unavailable, I found a few more options! And for a little extra fun, I found a champagne colored version! After seeing all the fun options, I’m getting over-the-top excited about the upcoming bedroom makeover. It’s still possible that I’ll end up reusing our existing nightstands because they actually have a good shape. They’re just a bit dark and the tops are pretty beat up. Decisions, decisions! Project update: I painted our nightstands silver and LOVE them. You can see the painting process here and the finished bedroom makeover here. Do you LOVE the mirror glam look for master bedroom decor, or have I given you nightmares thinking about trying to keep them clean? Oh, and if you love glam, make sure you check out our master closet photos! These are all so pretty! Can you just paint, then have mirror pieces cut to fit the fronts/sides/tops of your existing nightstands?? Might be worth a try!! Happy Spring, Melissa!! Happy spring! We actually talked about that option last night. It’s definitely on the table! Excellent options! I love this look!! 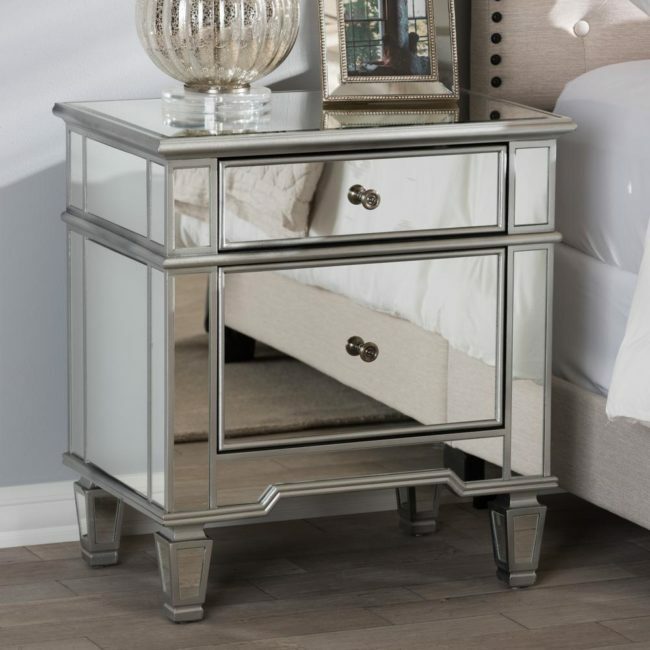 I love mirrored nightstands too! I don’t think they are practical at our house with all of the grubby little fingers we have in our home but I love the look. They really are stunning! Love the ones you rounded up. That is a GREAT suggestion! We don’t have one in Tulsa yet, but I’m going to Dallas during the bedroom makeover and do usually hit up Home Goods while I am there. Walmart has a few that can be ordered and shipped to the customer. A couple of them are highly recommended and one said it came fully assembled and is beautiful. I have not ordered one from them, but was looking at them to maybe order. That disappoints me that they could not help you to get that taken care of. I do not like them keeping my credit card on file either, but they do not ask you now, they just do it. Glad your credit card company could help you. I would be leery to order from Walmart too if this happened to me. Wonderful group of nightstands! I love them and for an affordable…SCORE! Thanks for sharing. Pinning and sharing.